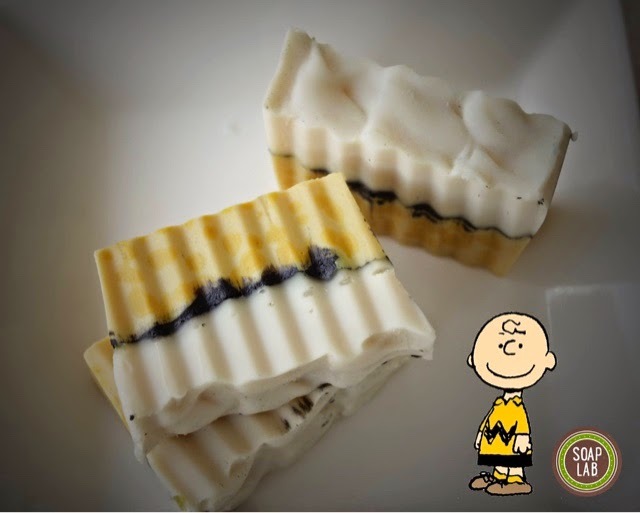 Hi guys, ok I have no idea why but I felt like doing a cartoon character inspired soap so I did a peanut character inspired soap. 3) prepare your lye solution. Make sure you are wearing gloves at all time starting from this point. 4) add lye solution into the oil mixture and mix till light trace. Do not mix it too much till it goes on medium trace or thick trace as you will need the soap to be as liquid-y as possible to be able to decorate the soap. 5) separate soap mixture into two bowl. Add 1/2 teaspoon of titanium dioxide into one and 1/2teaspoon of yellow pigment into another one and mix till it blends properly. You can also mix these pigments into 1tablespoon of oil (any oil) to avoid it to be clumpy in soap. Add color as desired. 7) pour the yellow soap into the mold. Tap the mold lightly to ensure all bubbles are out. Then put a thin layer of black powder on the yellow soap using a spoon. Using the back of the spoon, lightly poke the spoon in the soap. This will create the zigzag effect. Once satisfied, pour the White soap on top. 8) leave it for about 18-24hours to unmold and cut. Hope you guys enjoyed this. I'm sorry I couldn't take a picture figuring this whole process. I did take pics but it turned out very blurry. Will be doing another similar soap and shall update that soon. Till then take care and happy soaping!